Here’s just a taste of some of the things you could try out while in Auckland for your Summer Research Scholarship. 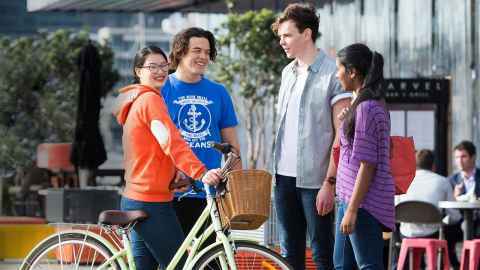 The University of Auckland has a unique vibe over the summer months. As a summer research scholar you’ll be part of a community of nearly 300 other students on summer scholarships, students taking Summer School, postgraduate research students, and students and academics visiting from around the world. Try surfing, paddleboarding, sailing or kayaking. On land, you could try bungee jumping, canyoning, rock climbing, laser tag or paintball. With markets, op-shops, shopping malls, shopping districts and designer stores, Aucklandoffers shopping from boutique to budget. See some of New Zealand’s wildlife up close at the Muriwai gannet colony, the island sanctuaries of Tiritiri Matangi and Rotoroa Islands or snorkel or take a glass-bottom boat tour at Goat Island Marine Reserve. Visit the many galleries, museums and theatres on offer - take in a performance or concert. Enjoy al fresco dining at one of Auckland’s many cafés, restaurants or wineries; or take a picnic to Albert Park or the Domain – both a short walk from the City and Grafton Campuses.